It was a different game than the other day against the hated Kings. This time, the Rangers showed plenty of resolve in rallying from a 3-1 deficit against the Original Six classic rival Bruins to earn a 4-3 home win in the shootout at MSG. The spirited comeback was a nice reward for the fans that stayed. Especially following a dismal second period that saw Boston turn it around with three straight goals over a 4:34 span. It would’ve been easy for the lesser talented Blueshirts to give in. Rather than dwell on it, they turned the page. Playing a enthusiastic, aggressive game in the third, they fought back with two consecutive goals in a 3:17 span to get the game tied. It was a splendid effort from the fresher home team, who had the advantage of not playing the night before as the Bruins had. They were playing the second half of a back-to-back after defeating the Islanders at home 3-1. For a change, the Rangers didn’t solely rely on the red hot top line led by Mika Zibanejad to get back in it. Instead, a few key young players stepped up at the right time to shine. Pavel Buchnevich played a good game overall. In the third, he was directly involved in both goals. He earned two big assists on Kevin Hayes’ goal and rookie Filip Chytil’s 10th on the power play that tied the contest at three. Coach David Quinn decided to make a change to the second line for the third period. He moved up Jimmy Vesey with Hayes and Buchnevich. It wasn’t necessarily something wrong Chytil did. But more of a sense to change the momentum. Sure enough, Vesey was in the right spot digging out a rebound following a Buchnevich rush before centering for Hayes in front to cut the deficit to one with 10:36 left. With the crowd suddenly back in it after being very quiet previously, the Rangers continued to apply pressure on the Bruins. Eventually, Boston defenseman Charlie McAvoy took a ill advised penalty for boarding Zibanejad directly from behind. It was a foolish move that could’ve been more than a minor. But Zibanejad was okay. A infuriated Tony DeAngelo immediately went after McAvoy after the whistle. Fortunately, he didn’t get a retaliation penalty that could’ve been costly. Instead, DeAngelo was involved in the tying goal that Chytil scored. The emerging right defenseman, who earlier sent Buchnevich on a rush that resulted in Hayes’ 12th, got the puck to Buchnevich down low. 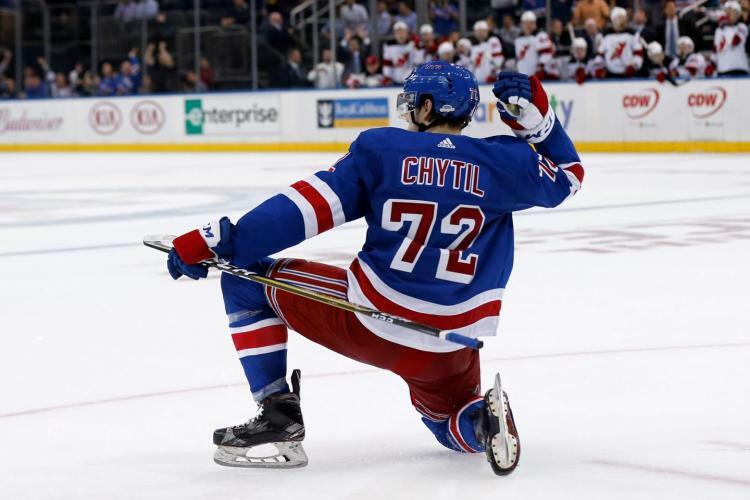 Chytil was able to get to a rebound of a Buchnevich shot off the goalpost to score a huge power play goal with 7:19 remaining in regulation. For most of the night, the Rangers failed to capitalize on a ineffective power play due to an aggressive Bruins penalty kill along with some sloppy turnovers. However, all they needed was one to force overtime. Before a hectic and wild three-on-three over five minutes, both backup goalies made key stops to take the game to OT. Alexandar Georgiev had been solid throughout. None of Boston’s three goals were his fault. Following Zibanejad’s 23rd from Mats Zuccarello in the first, Danton Heinen redirected a Matt Grzelcyk point shot from Brad Marchand to tie the score at 10:37 of the second. A brutal giveaway by defenseman Brendan Smith led to David Pastrnak tipping in a nice David Krejci feed in front for a 2-1 Boston lead 72 seconds later. Patrice Bergeron got the third B’s goal on a power play. With DeAngelo off for tripping, the terrific number one center who just played in his 1,000th career game, was able to deflect home a Torey Krug shot at 15:11 for a two-goal lead. Marchand set it up for his second assist of the period. It took a strong third by a refocused Rangers to tie the game. Georgiev made a couple of clutch saves as did counterpart Jaro Halak (36 saves). The overtime was really something. I’m glad we stayed. To think what I would’ve missed. Three-on-three hockey is as good as it gets. Sure. It’s not five-on-five or four-on-four, but doesn’t have to be. This is how all games should be decided. Especially for the valuable extra points. There were endless rushes by both sides forcing each goalie to come up with the goods. The best two saves were Georgiev stoning a Bruin on a lacrosse try point blank, followed by a sprawling Halak making a remarkable diving glove save to rob Zibanejad of the winner. The Rangers got six of the seven shots- coming oh so close several times. But Boston also had a couple of glorious opportunities that missed wide. The shootout needed seven rounds to decide a winner. It was necessary due to Marchand tying it in the bottom of the third in direct response to Zibanejad. Then, it became a goalie show. Neither Halak nor Georgiev would budge. Eventually, Quinn sent out DeAngelo in the seventh round. Having played a very good game logging over 24 minutes, he was able to beat Halak to put the Rangers up 2-1. Georgiev made one final glove save to deny Krejci to seal the victory. This entry was posted in NYRangers and tagged Alexandar Georgiev, Brad Marchand, Bruins, Charlie McAvoy, Danton Heinen, David Pastrnak, David Quinn, Filip Chytil, Jaro Halak, Jimmy Vesey, Kevin Hayes, Mats Zuccarello, Matt Grzelcyk, Mika Zibanejad, Patrice Bergeron, Pavel Buchnevich, Rangers, Tony DeAngelo. Bookmark the permalink.